The past quarter century has tested the supply-side theory that top-bracket tax cuts would boost economic growth and jobs. This theory has decidedly failed. The Bush-era tax rates stayed in place through 2012, but at the end of that year, President Barack Obama struck a deal to restore the 39.6 percent top tax rate and raise the tax rates on capital gains and dividends. Again, many conservatives predicted doomsday.7 However, the economy grew steadily, and the expansion is still continuing. 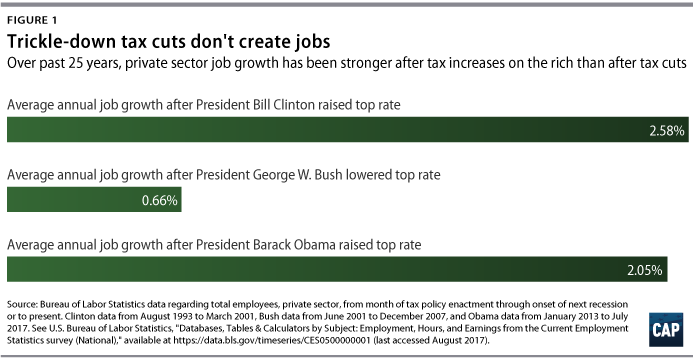 As Figure 1 shows, job growth has been much stronger following the two most recent increases in the top tax rate. 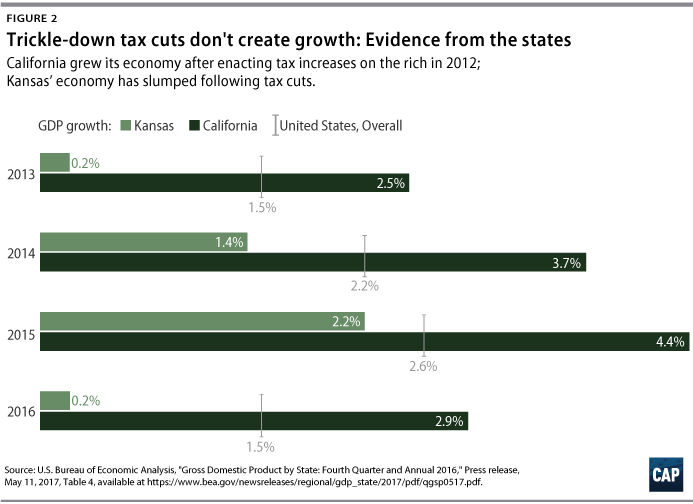 Given that there are innumerable factors behind how the economy performs, this recent history certainly does not prove that raising taxes on the rich causes the economy to grow or that cutting taxes on the rich causes it to lag. It does, however, provide powerful evidence refuting the claims made by the proponents of trickle-down tax cuts. 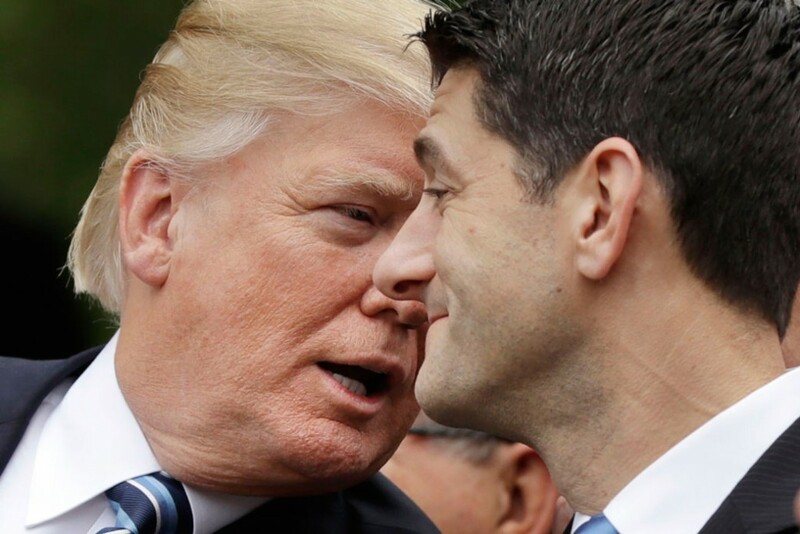 As with the significant cuts in domestic programs since 2011, the deficits resulting from unpaid-for tax cuts will undoubtedly be used to justify cutting programs that invest in the economy and support working families, harming our long-term prospects in the process.18 Federal investments in education, research, and infrastructure all create jobs and grow the economy over the long term.19 Researchers have found that Medicaid, nutrition assistance, and environmental protection all improve health outcomes and in turn increase productivity.20 Programs that improve the economic security of low-income children—such as nutrition assistance, housing subsidies, and tax credits like the Earned Income Tax Credit—raise children’s educational attainment and future earnings.21 For these reasons, tax cuts that threaten critical investments undermine the goal of broad-based prosperity. Seth Hanlon is a senior fellow at the Center for American Progress. Alexandra Thornton is senior director for Tax Policy at the Center.